You've heard the conventional wisdom: it's easier to win a new job if you already have a job. In other words, a person who is employed is viewed as more desirable than someone who is unemployed. And the terrifying corollary: If you've been fired, forget it. You're mud. My advice: don't sweat it. As long as you know you're a good worker, that your skills are solid, that you work with intelligence and enthusiasm, and that you're pursuing the right new job for the right reasons, you can get over the "I was fired" hump. It's the must-have Answer Kit you need to make your next move on your own terms... fearlessly. to avoid unnecessary risks when you leave any job. Plus How to succeed at your next job! how to leave your job fearlessly! Nick Corcodilos charges hundreds of dollars for a private Talk To Nick coaching session. For a fraction of that, you can profit from 73 pages of Nick's acclaimed insider advice about how to change jobs on your own terms... delivered in Parting Company in the same no-punches-pulled conversational style he's known for. 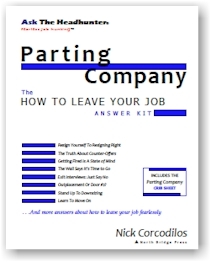 No matter why you're leaving your job -- get Nick's easy-to-understand advice about how to do it on your own terms! Don't panic or blow it when Parting Company! Can you afford not to know how to leave your job? Get the Ask The Headhunter edge now! "This is like reading a high-priced consultant's report to discover the "BFO" (blinding flash of the obvious). A lot of what you write makes absolute sense. It's intuitive (dare I say innate) and yet so many of us continue to follow traditional HR dogma when searching for work. Shame." "The great news about your recommendations is that they work. The good news for those of us who use them is that few people are really willing to implement what you recommend, giving those of us who do an edge." "I read your columns and have bought your book (and read it several times). It sits on my desk to refer to. It changed the way I look at job hunting 180 degrees! I recommend it to everyone who has need of it (and most have bought it!). If you do a sequel, I will buy that one, too." "Nick, you probably know that you are the one writer in the country (or the world) that I never disagree with. You hit all the notes that I have been crying 'alarm' about since 1970 myself. You are uncannily on target, all the time. God bless your work, as always." "Nick... what can I do but join the teeming throngs of folks chanting your praises? No-BS, tell-it-like-it-is folks like you are too damned rare. I'm emailing you to say thanks. You are my new hero." "I am a retired USAF officer who just got furloughed out of four years with Northwest Airlines. I feel like I have just cut through a thunderstorm and found smooth air and bright sunshine on the other side. Thanks!" "I like your no-nonsense approach to the search-related topics you tackle. You are not afraid to go against the grain and shake things up with a dose of reality and responsibility. I LIKE IT!"